Treat them to a turkey dish they've never tasted before with our Dijon Roasted Turkey Recipe. Dijon mustard spread inside and under the skin of a whole turkey before roasting yields a more flavorful and juicy bird in this Dijon Roasted Turkey Recipe. Remove neck and giblets from turkey cavities. Rinse turkey; pat dry with paper towels. Free legs from tucked position. (Do not cut band of skin.) Using rubber spatula or hand, loosen skin over breast, starting at body cavity opening by legs. Spread 2 Tbsp. mustard inside body cavity; spread remaining mustard onto meat under skin. Use wooden toothpicks to secure skin at opening. Return legs to tucked position; turn wings back to hold neck skin in place. Place turkey, breast side up, on rack in shallow open pan; brush with oil. Bake 3-1/2 hours to 3-3/4 hours or until done (165°F), covering breast loosely with foil to prevent overbrowning if necessary. Remove from oven. Let stand 15 to 20 min. before carving. Discard toothpicks before serving. 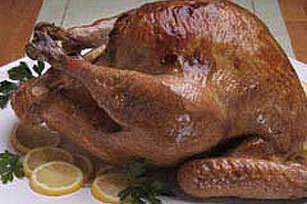 Thaw a frozen turkey, breast-side up, in its unopened wrapper on tray in refrigerator. Allow 5 hours per pound to completely thaw the turkey. Never thaw frozen meat on the countertop at room temperature.